Use it for aquatherapy, rehabilitation, aquatraining or swimming support. Buoyancy bodies (20 mm in the back and front area) guarantee an upright position and thus a natural spinal load, optimum buoyancy and unrestricted movement in the water. 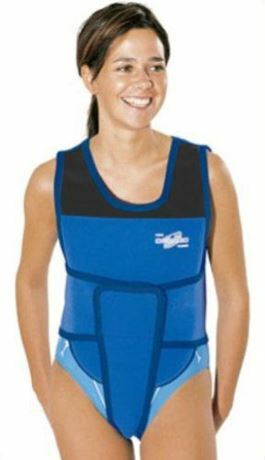 Infinitely adjustable waist and crotch strap for perfect adaptation of the buoyancy vest to the body. ATTENTION: not a live jacket - provides buoyancy with integrated buoyance pads. This will make swimming easier. Not confident swimmers should use this vest only under survey. Every swimming device should only be used when observation is ensured.